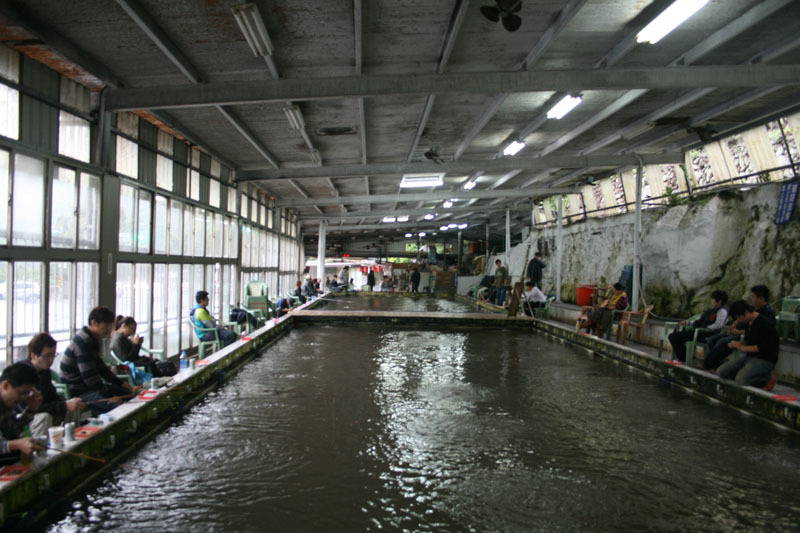 I had heard about prawn fishing before I came to Taipei, and was keen to try it out. Although not located in the centre, there are at least two areas where it is possible. If you're not a vegetarian, then this is the best way to spend a Sunday afternoon in Taipei. 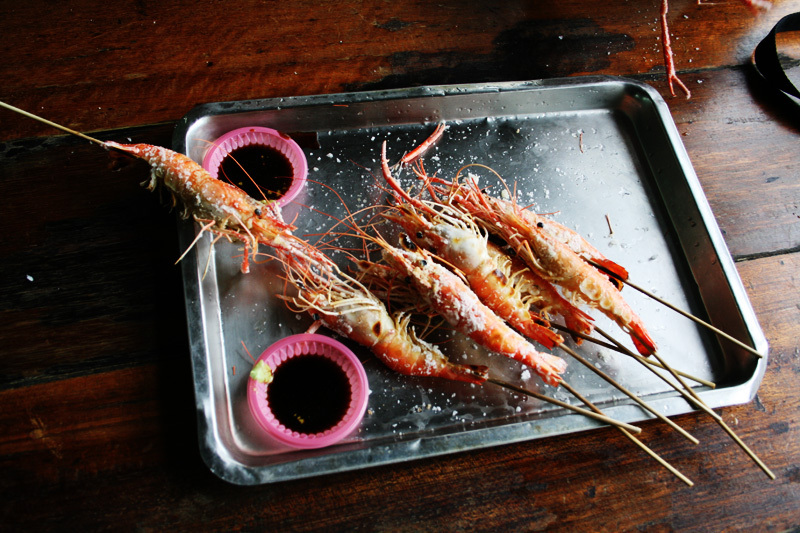 Fishing for prawns is relaxing, satisfying, exciting, and totally Taiwanese. The easiest way to get to the prawn fishing place is to catch the MRT to Shilin station, take exit one and walk straight down to the main road and catch bus 255 at the bus stops on the right to Waishuangxi Bridge (外雙溪橋). The prawn-fishing place is right next to this stop (it's a long building with a big entrance). you can also catch the 小18, 小19，市民小巴 from Jiantian MRT station as well as the 棕13 from Dazhi MRT station. When you arrive, don't be too surprised but they don't speak English and they aren’t very helpful, but it’s pretty easy to figure out what you do. You pay 500NT ($18) and get a fishing rod, knife, hook and bait (some liver and dried-shrimps). This is for 2 hours of fun! You pay at the end, so if you go over time, they'll charge you then. Also, if you lose the hook or finish your bait, just ask for me for free. Choose a pool and get some chairs and have a seat. You will notice that other people have nets where they put the prawns they have caught. Where we went, they were hanging on the wall, so get a net and tie it to the hooks near the pool and drop it in. Although different people say different things, it was clear that the prawns prefer the liver, and me and my friends found out that a combination of dried-shrimp and liver is the best. If you have sausage fingers this can be fiddly: cut the liver pretty small (no bigger than the size of the largest dried-shrimp) and hook it firmly on to the hook. Then gently put the line and hook into the water. 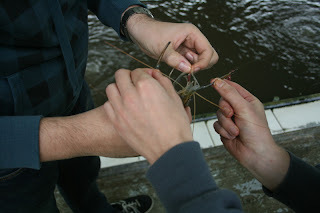 When you feel a bite, don’t do anything, you should feel a few tugs, and then just gently pull the line with shrimp out of the water. 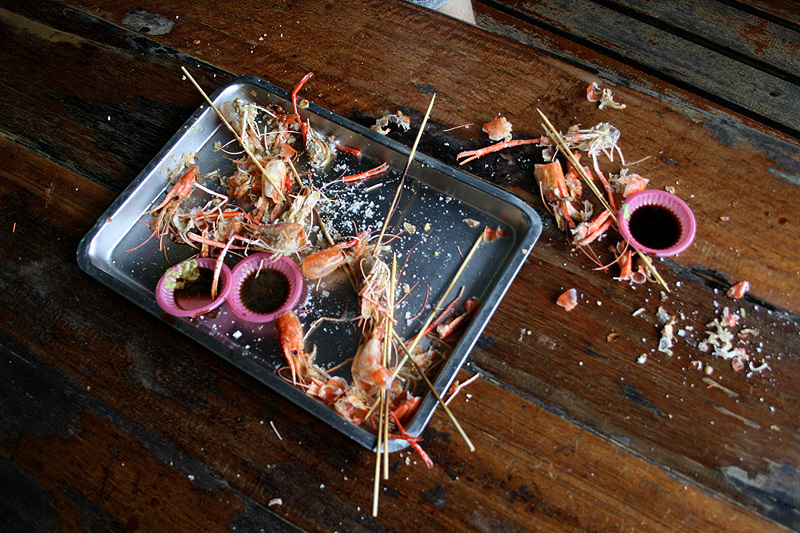 If you pull too hard, or react too quickly, the shrimp might get away. When you have him, don’t be scared of his weird claw-arms (it really doesn’t hurt if he pinches), and unhook his mouth. Then put him in the net that you got earlier, to await his doom. 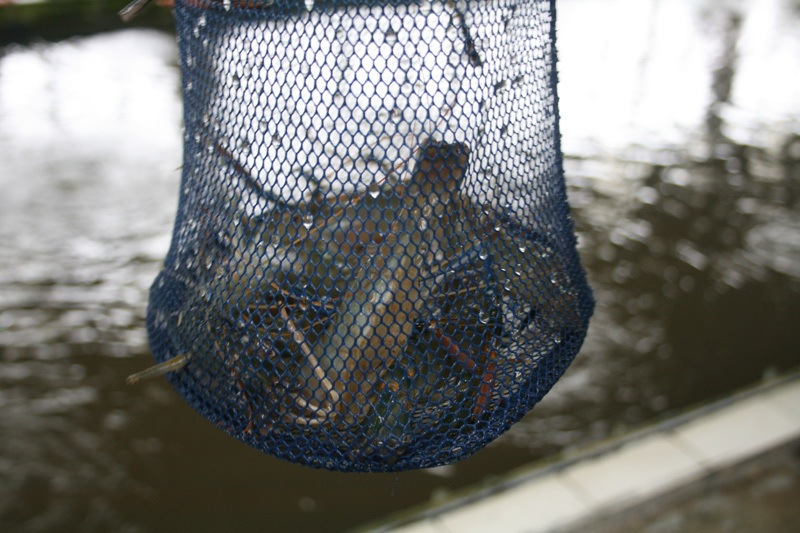 The amount of prawns you catch is not so dependent on your skill as a shrimper, but rather on how many of them there are in the pool. You will notice that the owner will periodically restock the pool’s supply by tipping a large crate of live prawns into the water. So sit back, relax and enjoy a beer or two (you can get them from the fridge, and they’ll charge you later) while you gradually catch your next meal. When you’re done, hand in your gear in exchange for some skewers and wasabi-soy sauce. You’ll be directed to the grills and a huge pile of salt. This next bit is definitely the hardest part, and its better just get it over with. Part one is to skewer the (still struggling) catch of the day. You do this by holding it firmly in your left hand by the back, and shoving (for lack of a better word) the skewer under the tail through its abdomen (because I have a better word) and into its head. If you get the head, you will most likely kill it quickly, and it will stop struggling. Part two is to salt them up. Put them on the salt mountain, turn them around a few times so they’re nicely salted and while you’re doing the others, just leave them in the salt. Part three is to fire up them grills (you might need assistance) once they’re salted and cook them. The warm light of the fire will calm your nerves and as they turn a delicious red, you will forget what you just did to your dinner. They should take about 5 minutes to cook, turning them around occasionally. Head over to the tables with your freshly caught supper, dip them in the sauce and enjoy! The place I went to didn’t offer any other dishes or meals, except instant noodles, so it might be worth bringing your own accompaniments. Wow all those picture are so amazing and fabulous I don't have to time to come to this place, but whenever I do I see some really amazing things keep up the good work! we are going today too, same shop, really good experience! !